Itâ€™s been awhile since B.A.S.S. held a top-level tournament on Bull Shoals. Seems the history rich fishery has simply been forgotten in time along our travels to newfound tournament fisheries from Falcon Lake, TX to Oneida, NY. Ron Shuffield won the last big B.A.S.S. derby here 21 years ago in 1991. And two years before, in October of 1989, career-long Quantum pro Gary Klein won with a skinny 30-pounds. Klein outsmarted the stingy fishery 23 years ago with West Coast techniques in The Bullâ€™s clear waters– exclusively with spinning tackle. In fact, he joked recently about the fact that even though he showed living legend Rick Clunn the pattern in practice that week, Clunn, like most southern pros, rejected the light line and â€œegg beaterâ€ looking reel regimen. So history begs to know whether we might see a very rare spinning tackle driven Elite Series win this week on The Bull. â€œSpinning tackle could be a factor today, especially if it slicks off under calm winds and sunny skies,â€ said Marty Robinson, sporting his favorite Carhartt knit cap on a chilly morning at the Bull Shoals Lake Boat Dock and Marina. Terry â€œBig Showâ€ Scroggins says thereâ€™s no doubt spinning reels will play a role for successful anglers this week. â€œYouâ€™re either gonna fish rock, or youâ€™re gonna fish rock,â€ joked the Toyota pro just prior to standing for the The Star Spangled Banner. â€œWeather will determine if the bass are on shallow rock, suspended, or on deep rock,â€ said Scroggins. â€œYou might be catching them shallow one day on crankbaits and spinnerbaits, and then the weather changes, and theyâ€™ll shoot down the hill in a hurry to deeper rock, and thatâ€™s when shaky heads and drop-shots on spinning reels will be a factor,â€ predicts Scroggins. 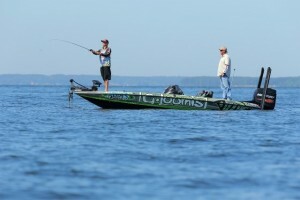 Robinson and Scroggins both agree spinning reels will be a factor, but neither was willing to say this event would be won with a spinning reel in hand. However, the never bashful Gerald Swindle says no way will they spin to win. â€œNope. The guy that wins this has to catch at least one 4-pounder each day, and I donâ€™t see that happening with spinning tackle over a four day event,â€ said Swindle. â€œThereâ€™s a 15-inch minimum length limit on largemouth in this lake, and I donâ€™t see anybody catching a pile of bass bigger than 15-inches with spinning tackle,â€ added Swindle, as he pulled a Quantum size 30 Energy Spinning reel from his rod locker just in case. â€œWhen Gary Klein won here with spinning tackle, the water was probably a lot cleaner. The only dude in this tournament that has even a remote chance to win with spinning tackle is Aaron Martens,â€ said Swindle.